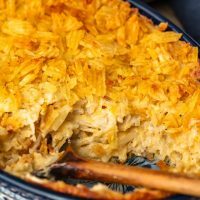 Cheesy Potato Casserole is the ideal holiday side dish recipe for anyone that loves cheese and potatoes. 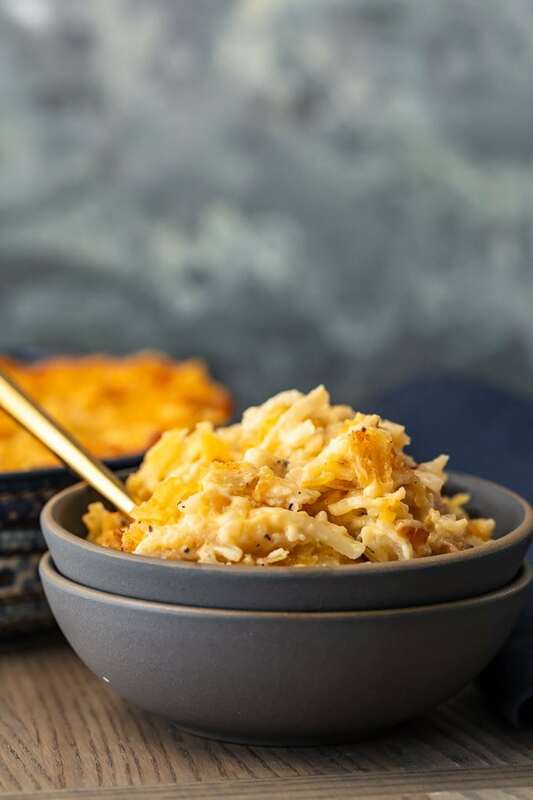 This hash brown potato casserole recipe is super easy, super cheesy, and topped off with a crunchy potato chip topping! 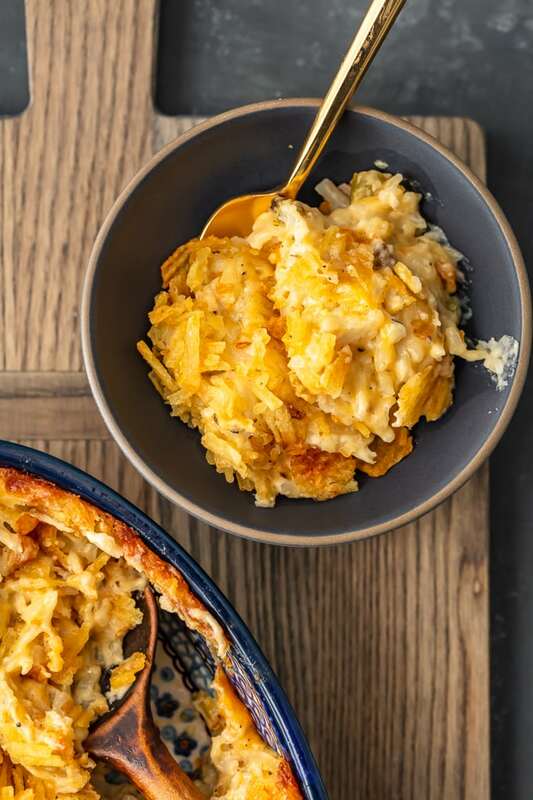 Cheesy Potato Casserole is a dream side dish for cheesy potato lovers like myself. 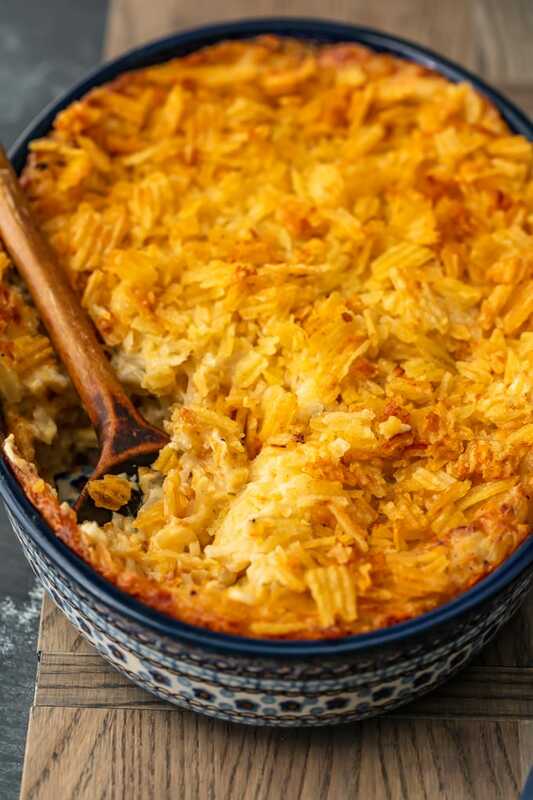 This hash brown potato casserole recipe is the perfect easy recipe to add to the holiday table! The holiday season calls for ALL of the casserole recipes you can think of. 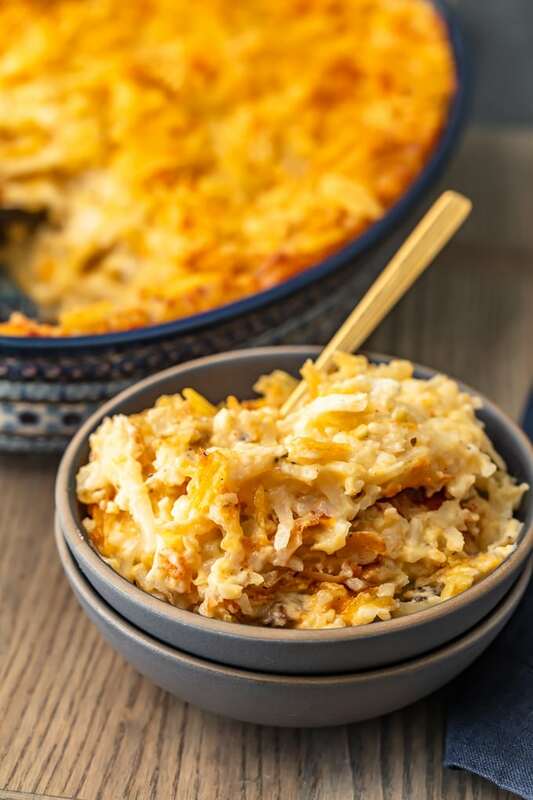 This Cheesy Potato Casserole is a mix of two of my favorites: cheese and potatoes! And to make it extra easy, we’re using frozen hash browns to make it. 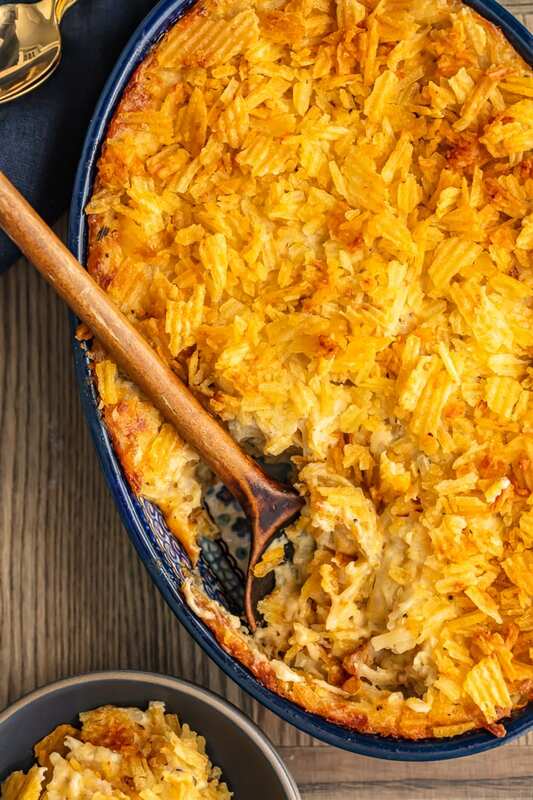 Even better, you can prepare this cheesy hash brown casserole ahead of time to save yourself a bit of stress. 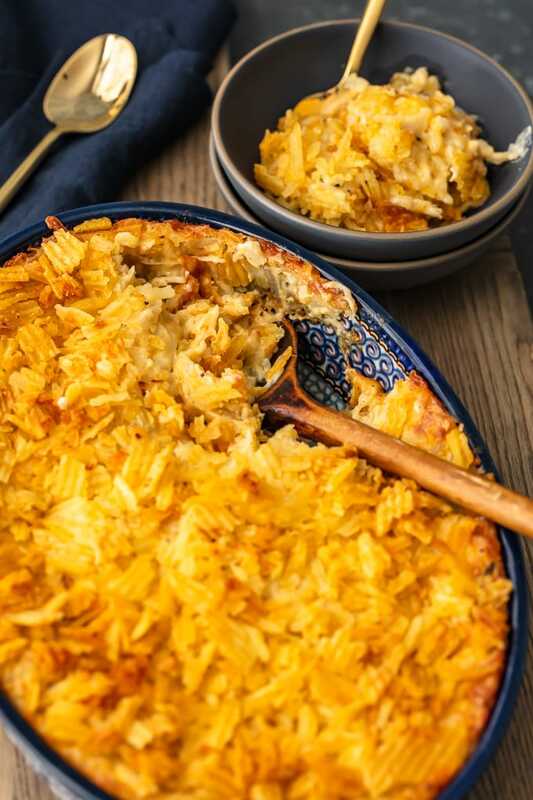 Not only do you get the cheesy hash brown goodness, but the casserole is topped off with a super crunchy potato chip topping made with butter and herbs. That extra crispness is the perfect addition to the creamy texture of the potatoes. Everything mixes together to make the most amazing side dish for Thanksgiving, Christmas, Easter, or any time really. Make this Easy Cheesy Potato Casserole recipe for your next holiday feast. It’s sure to become your new favorite side dish! Easy and cheesy are two of my favorite words…and potato is a close third! 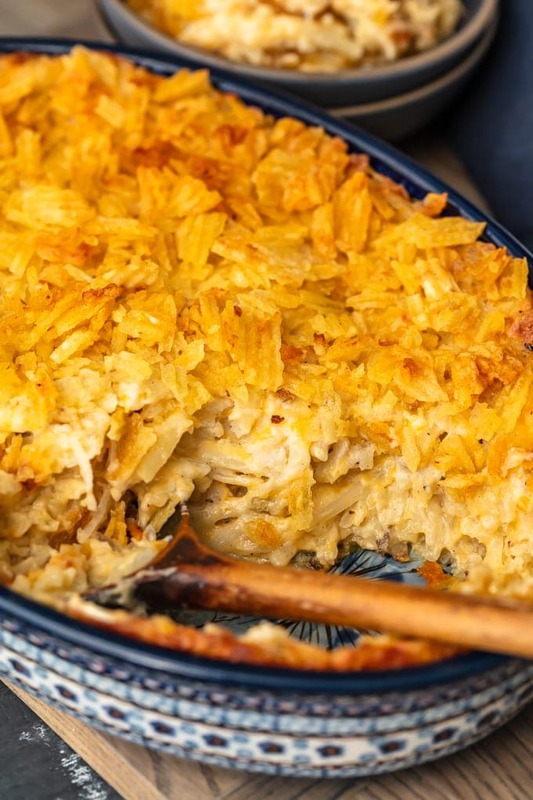 Together, they make the perfect cheesy hash brown potato casserole recipe. This recipe is so easy to make, and it works so well with just about every dish. These cheesy potatoes will be right at home along with green bean casserole, mashed potatoes (you should always have more than one potato recipe on the holidays if you ask me), and turkey or ham. What are the ingredients for cheesy potato casserole? This cheesy potato casserole is so simple! Since we’re starting off with frozen hash browns, it’s really easy to make the potato mixture. Once that’s ready, you can add the potato chip topping and bake. No hassle, just cheeeeeesy potatoes. Let the frozen hash browns thaw partially before starting. Heat butter and oil in a medium skillet, than saute the onions. Whisk together melted butter, celery and mushroom soups, grated cheese, and sour cream, then add in the sauteed onions and stir. Mix in the hash browns, pour the potato mixture into the prepared casserole dish, and add the potato chip topping. Bake for 45-55 minutes at 350°F. When it’s done, the potato chips will be browned, but make sure they don’t burn. Let the cheesy potato casserole cool for about 5 minutes before serving. Check the recipe card below for more detailed instructions. Can you make cheesy potato casserole ahead of time? Yes! 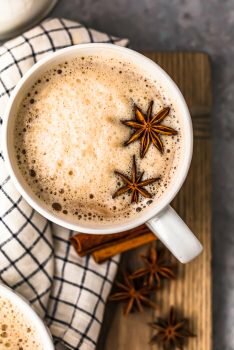 I love easy recipes for the holidays, and nothing is easier than something you can make ahead of time! Just follow the recipe as written to prepare the potatoes, but hold off on cooking them or adding the topping. That will be done later on. Once you have the cheesy potato casserole mixture in the baking dish, cover in with plastic wrap and store it in the refrigerator until you’re ready to bake (up to 48 hours). When it’s time to cook, set the casserole out at room temperature for about 30 minutes ahead of time. This is a great time to preheat the oven and make the potato chip topping. Add it on top of the potatoes and bake at 350°F. Add 5-10 minutes to the cooking time listed in the recipe card if needed. 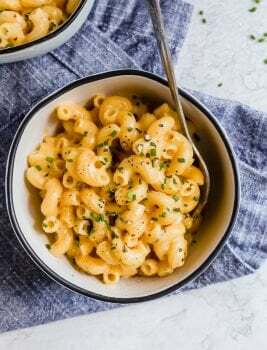 I love that this is another make ahead side dish you can add to the holiday menu, along with Make Ahead Mashed Potatoes and Make Ahead Turkey Gravy. Speaking of easy side dishes, I’ve got plenty more to share. When it comes to the holidays (especially Thanksgiving), I need ALL the easy recipes. Luckily this Cheesy Potato Casserole recipe fits the bill. They’re simple, delicious, and taste so good with the rest of the recipes on the table. Try it out for Christmas, Easter dinner, or any other holiday! 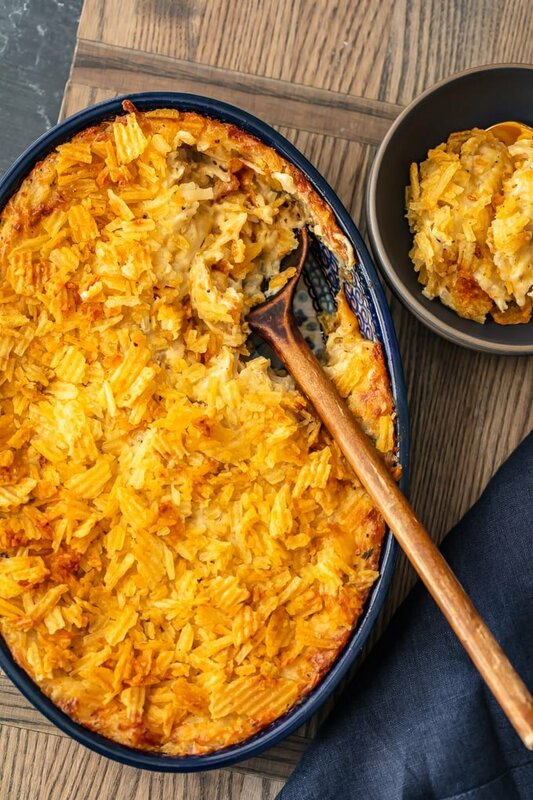 This Cheesy Potato Casserole is the perfect side dish for Thanksgiving and beyond. Next time you’re in need of some deliciously cheesy potatoes, make this recipe! See the recipe card below for details on how to make Cheesy Potato Casserole recipe. Enjoy! Heat oven to 350°F and spray a 9x13 or a 2 quart baking dish with nonstick spray. Heat a medium skillet over medium heat. Add two tablespoons butter and the oil. Once the butter and oil are hot, add the diced onion and sauté until the onion is translucent and tender. In a very large mixing bowl, whisk together the remaining 4 tablespoons melted butter, celery soup, mushroom soup, sour cream and 1 cup grated cheese. Add in the sautéed onion (along with the oil & butter). Add the hash browns and mix thoroughly until all ingredients are incorporated. Transfer the potato mixture to the prepared dish and cover with the potato chip topping. Bake at 350°F for 45-55 minutes or until mixture is hot throughout and bubbly around the edged. The chips will look toasty but shouldn’t be burnt. Prepare the potatoes without the topping, cover with plastic wrap and refrigerate up to 48 hours. When ready to cook, remove the casserole from the refrigerator 30 minutes before cooking. Add the potato chip topping (can also be made ahead) and bake. An additional 5-10 minutes baking time might be needed.